Over the last six months, we have seen consistent bi-weekly rounds of invitations issued to candidates with profiles in the federal Express Entry system. 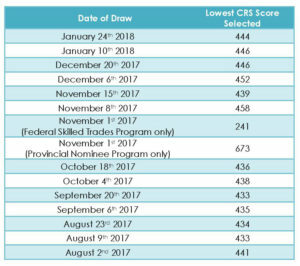 Given the current distribution of candidates in the Express Entry pool, we anticipate selection of candidates with scores in the range of approximately 430-450 to continue into the 2018 year. To maximize your likelihood of selection and approval, please contact our office. BartLAW Canadian Immigration, Barristers and Solicitors won “Law Firm of the Year – Immigration Law – Canada” by Lawyer International – Legal 100 – 2018 – Awards. Jacqueline Bart receive the following award: “Immigration & Nationality – Lawyer of the Year – Canada” by Finance Monthly Law Awards 2018. BartLAW Canadian Immigration, Barristers and Solicitors won “Law Firm of the Year – Immigration Law – Canada” by M&A Today – Global Awards – 2018.